Did you set lofty 2019 goals at your nonprofit? Make them happen by connecting with expert marketing, tech, HR, finance, and strategy volunteers who are passionate about your mission. Join Taproot Foundation’s free webinar for nonprofits on Thursday, January 31 for all the tools you’ll need to tap into this valuable support. 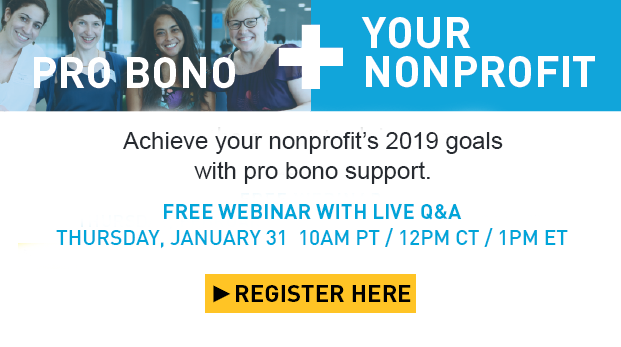 During the event, you’ll learn how to design and manage a successful pro bono project with Taproot’s pool of over 50,000 experienced business professionals on the free online platform, Taproot+. Access to Taproot's programs and this webinar are completely cost free. Can't attend live? Register anyway and we'll send you the recording! Companies Are Looking to Scale Their Pro Bono Programs, but How? There Is No "One Size Fits All."